The UK's Oxfordshire-based RealSound and Vision has completed the installation of a Community sound system for Cedar Sports Management Ltd. at Bar Sport in Maidenhead, Berkshire. The new Bar Sport venue is located at Grenfell Island, a popular area in the town for cafés, bars, restaurants and the cinema. "Being a sports venue, the timeline for their scheduled opening was pretty much dictated by Euro 2012," said RealSound's managing director, David Nibbs. "This defined a tight schedule for the sound and dance floor lighting to be designed and installed, but with a decisive client and good service from our suppliers we were able to complete the installation on time." RealSound designed the system using Community ceiling loudspeakers to maintain clear sightlines to the bar's 42 video screens in the low-ceiling venue. "With high ambient noise levels we chose Community for their high efficiency, intelligibility and well defined coverage," said Nibbs. 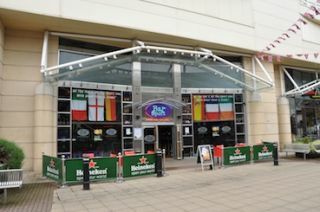 "Bar Sport has four zones over two levels and required 15 Community D6 ceiling loudspeakers to provide optimum coverage. Their high efficiency meant we only needed to tap each loudspeaker at 15W and could comfortably drive the system with a t&mSystems Project120.4P four zone power amplifier and still have ample headroom." "The more challenging area from a design perspective was the central dance floor," Nibbs continued. "With the ceiling height and sightline issue, traditional large box loudspeakers were unacceptable. I discussed this with Stuart Cunningham of CUK Audio, the Community distributor. He came up with an unusual but ideal proposal, suggesting four Community MX10 monitor loudspeakers, ceiling mounted at each corner of the dance floor. This provided a perfect solution: with their mounting brackets, the MX10s were easy to ceiling mount and presented minimal intrusion into the room. The loudspeakers could be accurately directed to the dance floor, minimizing reflected sound both within the venue, and to the surrounding residential areas. And the MX10 uses the same family of drivers as the D6, giving consistent sound quality throughout the venue." The dance floor system is completed by two Community VLF212 subs for high power low frequency energy. A Powersoft M28Q four channel amplifier drives the dance floor system. System control is via a DBX ZonePro 1261 central processor, with four DBX ZC-8 remote control wall plates providing user flexibility. The venue is additionally used for both live music events and DJ entertainment. In the DJ booth, RealSound provided a Denon DN-X1100 DJ mixer and two Denon DN-SC3900 media players. For continuous music playback throughout the day, they also installed a Tascam CD200i CD player with integral iPod dock plus a Numark iDec as a second iPod docking and control facility. A very compact and discreet lighting system was also installed around the dance floor, consisting of six Chauvet ColorBand Pix RGB LED battens and two Chauvet DMF10 LED moonflowers, operated via a Martin Professional 2510 lighting controller. "The Community loudspeakers allowed us to achieve a powerful foreground system very discreetly, and the client is suitably impressed with the result," said Nibbs. "Bar Sport has chosen a bumper sporting year to open this new venue and I'm pleased we've delivered a system which will enable their customers to enjoy the many upcoming events to the fullest." Kareem Naaman, managing director of Cedar Sports Management Ltd., added, "I had a very tight deadline to meet and David and his team were able to react and meet the deadline and the budget I had given them without compromising on quality. I knew what I wanted to achieve for the venue and RealSound was able to suggest some very creative ideas which have given me a great sound and lighting system for my sports bar."